On Sunday, I attended my first-ever one-man performance. Taking place at The Complex in Hollywood as part of the Hollywood Fringe Festival, I saw “What Be G*d is Blessing”, a one-man performance written and performed by Sean Topps. 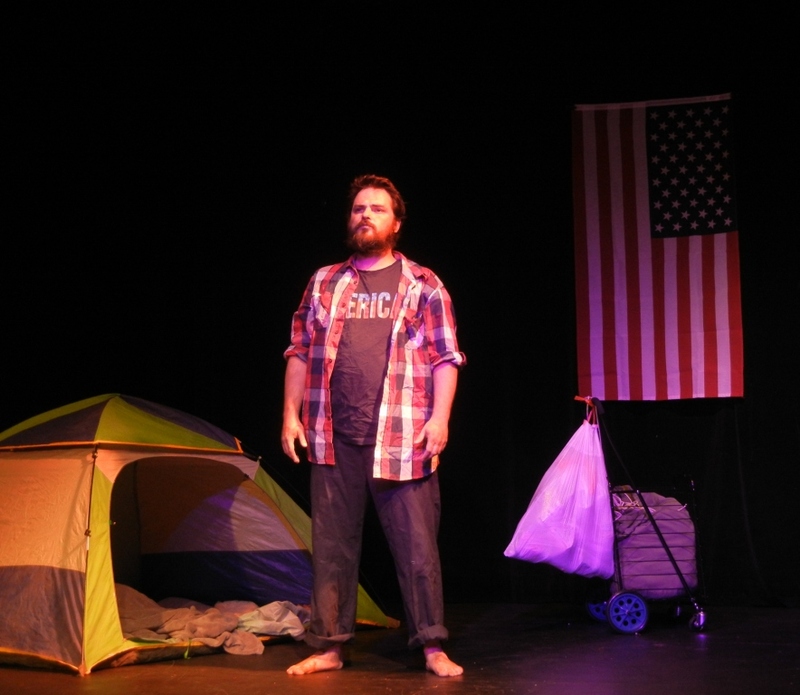 “What Be G*d is Blessing” is a performance in which the main character, a US war veteran, delivers his speech about his experiences. Sitting in the smallish theater (there were roughly 50 seats, with maybe a dozen and a half attendees), the performance was easily audible, personally impactful, and intimate. This intimacy was somewhat unsettling – intentionally so, it would seem – as Topps’ character, Derrick Jessup, spoke to us, looking at each of us directly in the eyes, while delivering his monologue. While I have never attended a one-man performance before, the experience was even more intense, as I know Topps socially, and to not only see him performing as a character, but also looking directly in one’s eyes, it can seem somewhat uncomfortable. However, as I mentioned above, this unsettling aspect is what helps Topps sell his war veteran character to the audience. And this is no mere war veteran who is living in a house with a family and a good job, this is a war veteran living on the streets of LA, unable to hold a job or to maintain a marriage. It would seem that his location suits this war vet comfortably, as he is uncomfortable with the boringness of living in a regular house and a regular job, with the lurking danger of predators outside of his tent. Those mortal dangers are a more comforting threat than the dullness and seeming usualness of contemporary life. 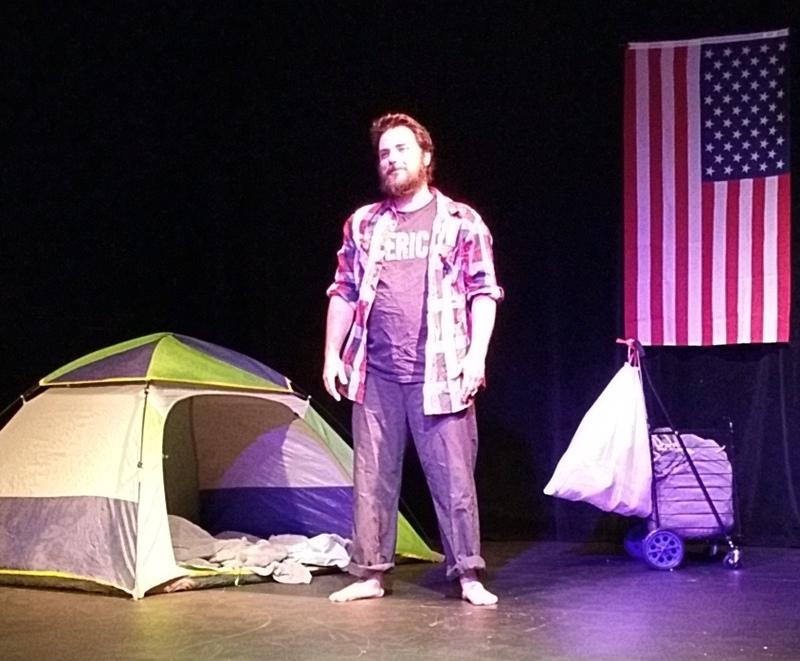 The performance begins with the lights down and startling crash, as Derek stumbles out of his tent and checks upon his cans and bottles that he has collected. 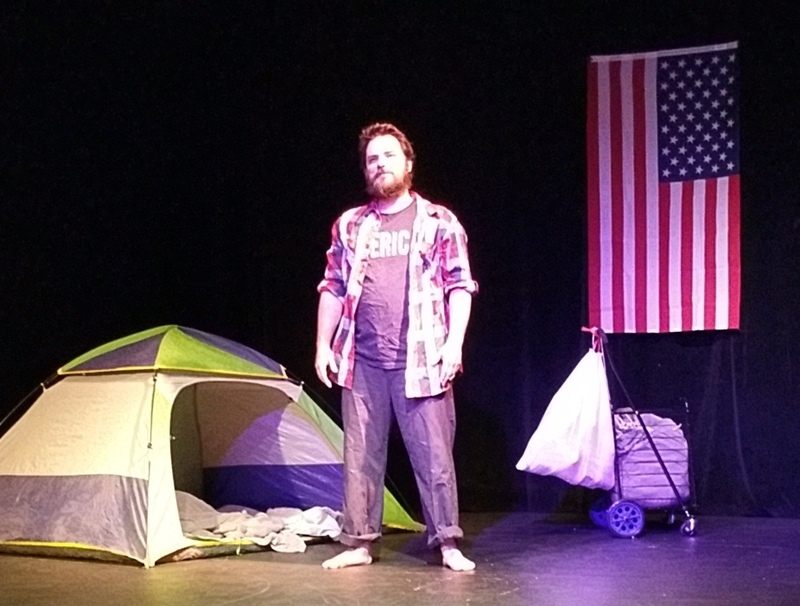 He then powerfully delivers his monologue to the audience, as he describes the joys and exhilaration of combat and shooting, contrasted with his sullen experiences with his post-combat stateside life. In addition to the compelling emotionality with which Topps plays Jessup, his disheveled appearance most certainly convinces the audience that Derek has gone through some rough times, with unkempt hair, grizzly beard, and a noticeably dirty appearance. His manginess contributes to an almost threatening feel, not only his physical appearance, but even his emotional affect, which further seems to effectively, yet appropriately, threaten the audience. This overall affect effectively sets the audience up to hear about one particularly difficult incident that seems to have caused him to end up on the streets. It left this audience member to at once feel appalled at Jessup’s behavior, yet somewhat understanding, if not sympathetic. Describing scenes of war’s mayhem, Topps uses the recurring theme of the sound of breaking bones as a way of conveying the shattering of other things — lives, psyches and indeed the fabric of society itself. He also conveys a powerful message regarding war’s futility, especially as it leaves entire generations of broken, dysfunctional souls in its wake. 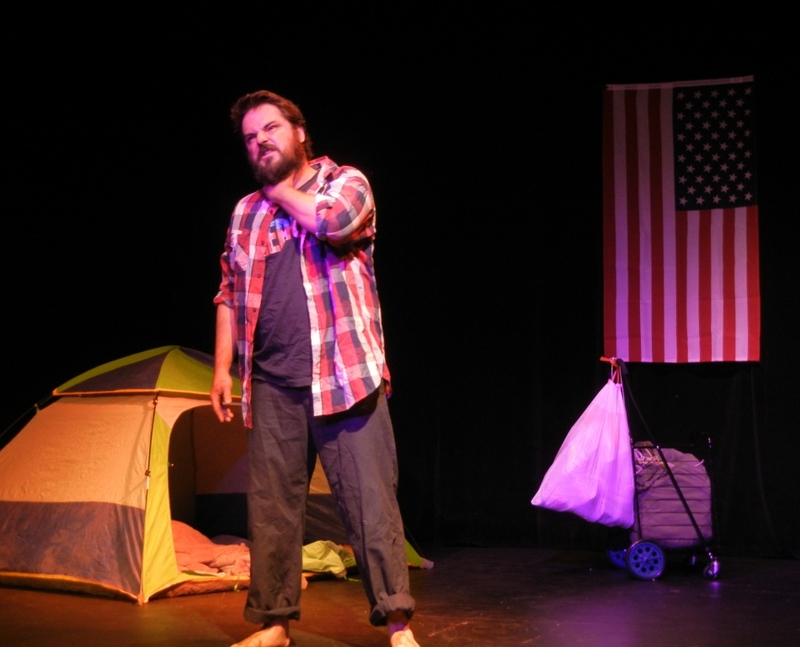 Presented by the East Forty First Company, Sunday’s roughly half-hour performance was the fourth performance of “What Be G*d is Blessing”, with the final performance during the Hollywood Fringe Festival to take place tomorrow night at 10:45pm (click here for tickets and information). The production of the play was made possible by EZ Roth Plumbing & Heating, Mint Carpet Cleaners, Westland Real Estate Group, and Milano Collection Premium Wigs.